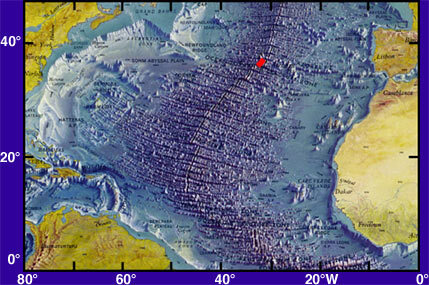 The discovery of “beach like terraces” beneath two miles of ocean water. This sand found deep beneath the ocean must have been located on a beach. Unexpected presence of many fresh-water diatoms in certain cores taken by the Albatross parallel to the coastline of Equatorial West Africa at a great distance off the coast (c. 900 km). Objects of nonoceanic origin: silicified epidermal cells belonging to terrestrial plants (Cyperaceae and Graminear) in many cores. Sand beaches and coral at depths of 2 miles south of the Azores. Fresh water diatoms have been found 2 miles down in the Azores area dated 10,000 to 12,000 BC. Ashes from volcanic eruptions usually stay in the same hemisphere as the erupting volcano. Only if the volcanic activity is happening close to the equator or is unusually forceful the sulphuric acid (SO4) from it will show in the ice cores in both hemispheres. Such an extraordinary forceful volcanic activity must have happened in the years 14063 to 14073 as we find high values of SO4 in the cores from the Antarctic as well as those from Greenland. Antarctica core: See detail and scientific sources. Greenland core: See detail and scientific sources. 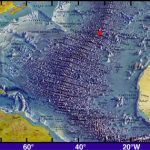 The classical philosopher and writer Plato (427 BC-347 BC) has described an oral account in detail about a big island in the Atlantic that disappeared in just one night. The Greek Historian Herodotus (c.484 BC – c.425 BC), living before Plato writes in Greek about the Atlantic Ocean, which he calls the Atlantis Sea. This fact disproves the theory that Plato himself invented the story. After Plato died many classical writers have mentioned a disappeared island empire in the Atlantic, among others Aelian in “Varia Historia”, 3 chapter18, Proclus, Greek philosopher, Marcellus, Roman consul, Diodorus Siculus, Greek historian (see above), besides Crantor, Plutarch, Pausanias, Theophrastus of Lesbos, Theopompus of Chios, Timagenes, and Aelianus..
Common features in the cultures on both sides of the Atlantic Ocean indicate a common origin coming from the middle of the Atlantic. Most obvious common features: Pyramids – flood and deluge legends – languages – words – human types – animal and plant life.